Emirates has been serving the US for more than 10 years, offering American consumers, communities and exporting companies direct flights to more than 50 cities not directly served by any American carrier. We proudly contribute to the goals of Open Skies which are: greater competition, increased flight frequency, promotion of business travel and tourism, improved service, customer-centric innovation, and consumer choice. Choice. It’s a wonderful thing. Discover tomorrow’s travel experience today on Emirates. Champagne flowed. Comfort was king. Passengers – royalty. Well, that age is long gone, replaced by one that's anything but golden. But don't worry, great things are coming. Tomorrow will be amazing. They promise. You just wait. But on one airline, you don't have to wait. The comfort. The food. The attention to detail. For every person in every seat, it's all yours to choose right now. 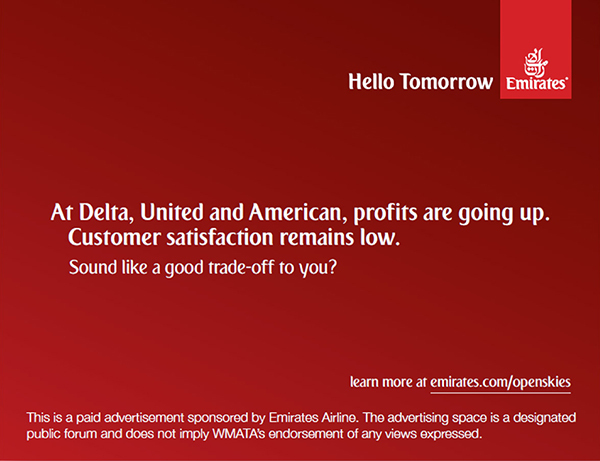 Tomorrow's travel experience is happening today on Emirates. Choice, it's a wonderful thing. 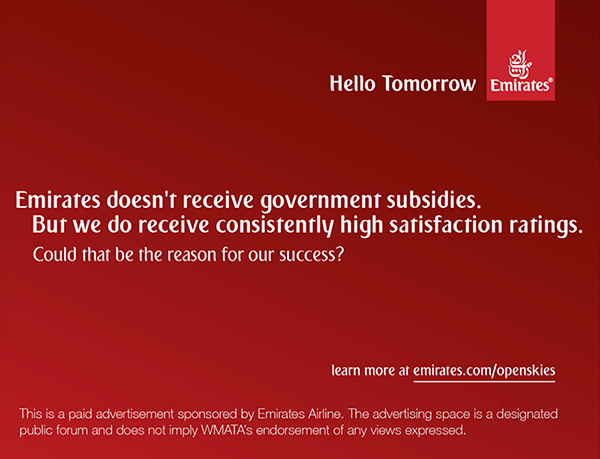 Emirates is not subsidized. We operate on a fully commercial basis and have been profitable for the past 27 years. Our accounts, audited by PricewaterhouseCoopers, have been published annually since 1993-94. Unfortunately, an oft repeated myth can ultimately be accepted as conventional wisdom. Our fact-based, point-by-point rebuttal to US legacy carriers’ subsidy allegations. Isn’t it interesting – that in the entire 55-page white paper presented by the Big 3 US carriers, alleging that Gulf carriers are causing harm to America, there is only one reference to consumers? 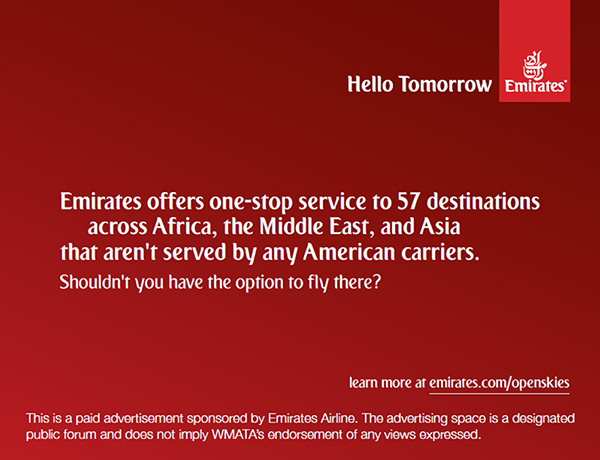 At Emirates, we know that we compete on a global stage. If we become complacent, and if we stop delivering the products and service that our customers expect, we will soon be out of business. That is why we continually invest in modern and comfortable aircraft, invest in the latest amenities onboard, and recruit passionate and talented individuals from 160 nations to join our team. Our industry-leading products and focus on customer service, have earned us over 500 awards. In 2013, Emirates made the single largest aircraft order by value in the history of U.S. commercial aviation with its order of 150 Boeing 777X aircraft. This record setting Boeing order supports over 400,000 American jobs, a number calculated based on the US Department of Commerce multiplier where every billion dollar of export goods supports 5,359 jobs. We also operate the biggest 777 fleet in the world today, with 145 Boeing 777 aircraft in operation, and another 199 units pending delivery. In addition to aircraft and engine orders, Emirates’ operations in the USA contribute over US$ 2.9 billion* of economic value each year to the regions we serve. We also enhance America’s international air connectivity, offering US travellers single-carrier access to over 50 destinations not served by any American carrier. How did the Big 3 US carriers come up with their count of 800 jobs lost with every international flight they don’t operate? 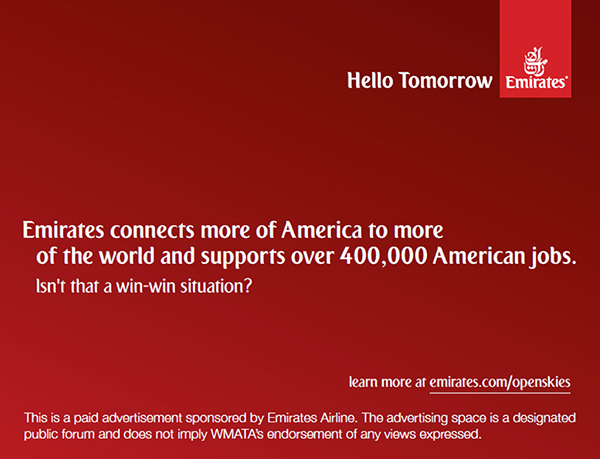 Emirates provides vital routes to the US via our hub in Dubai, that the Big 3 US carriers do not offer. Despite their claims that Emirates is “stealing” passengers, in reality there are very few network similarities between Emirates and the Big 3 US carriers. We offer one-stop services to 57 destinations across Africa, the Middle East, and Asia that are not served by any American carriers. Consumers are not proprietary to airlines. We cannot “take” or “steal” passengers, but we can earn their loyalty by offering great value for their money. We believe consumers will vote with their wallets and suitcases. Given a choice, they will fly with the airline that offers the best value and convenience in terms of flight routings, connection timings, services and amenities.